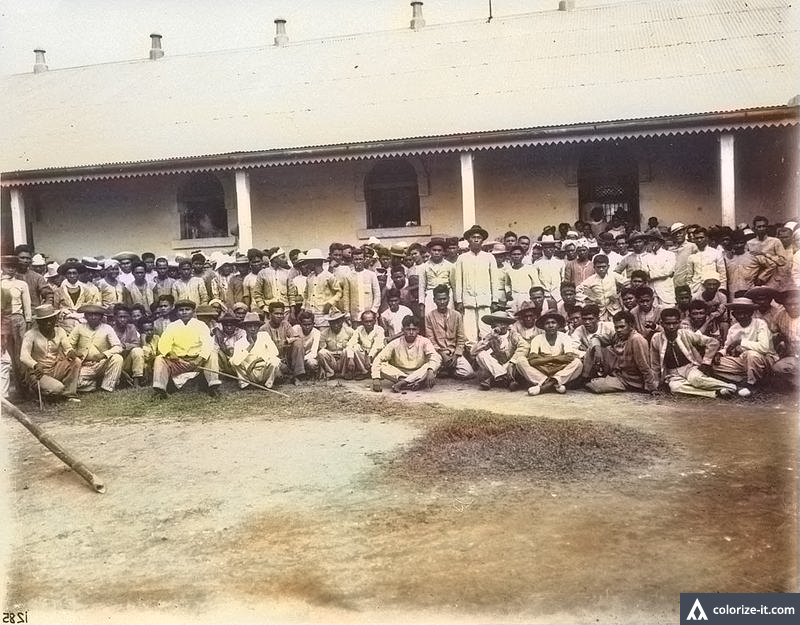 A photo of Filipino prisoners in Batangas, 1898. Image source: University of Wisconsin Digital Collections. The picture above was originally at the University of Wisconsin Digital Archives and part of the archives’ Wisconsin Philippine Image Collection. It was submitted to the archive by one Alfred W. McCoy and filed with the title “General Prisoners, Batangas 1898.” The time frame given by the archive is “Revolutionary Government Period,” which is likely a reference to the First Philippine Republic under General Emilio Aguinaldo. In other words, the picture was likely taken during that critical time when the Americans were intent on ruling the Philippines but the native Filipinos had other ideas; and the Philippine-American War was yet to flare up. Whether the people in the picture were prisoners of the previous Spanish colonial government or the hastily declared Philippine government is undetermined.